Puts on the FSU singlet for the first time since the 2011 outdoor track season…transfer from Northern Arizona has just one year of outdoor eligibility remaining…spent the cross country and indoor seasons training with the Seminoles and racing unattached…expected to compete in the steeplechase and longer distances events. Outdoor – placed sixth at the ACC Outdoor Championships in the 3000m steeplechase (10:23.95), her first competitive venture at the event…made her steeplechase debut in the 2000m event at the Seminole Invitational and won in 6:37.92. Indoor – posted a career-best 9:19.39 for 3000 meters at the Alex Wilson Invitational, narrowly missing an NCAA qualifying mark…finished sixth at the ACC Indoor Championships (9:24.34)…made her indoor debut with the `Noles at the UW Husky Classic, running 9:20.94 for 3000m. 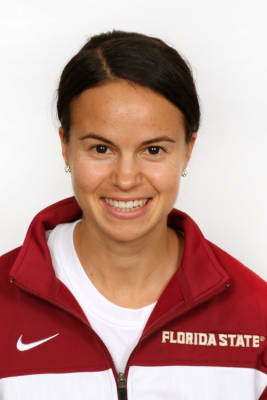 Transferred to FSU from Northern Arizona, where she earned multiple Big Sky Conference honors in cross country, indoor and outdoor track…prior to coming to the US attended Gymnasium Hofwil in Bern, Switzerland…placed second at the 2007 Switzerland U23 Cross Country Championships…was the 2006 Swiss junior cross country champion and also finished in the top 60 at the 2006 World Junior Cross Country Championships…was 24th at the 2005 European Junior Cross Country Championships…majoring in biological science..born Sept. 12, 1987.